TTWREIS Degree Colleges Principals Recruitment 2017, Apply before July 21: TSTWREIS TS ST RDC Principals Recruitment 2017, TS Gurukulams Principals Recruitment 2017, Download the application form of TTWREIS Principals Recruitment 2017, Last date to apply for Degree College Principals Recruitment 2017. 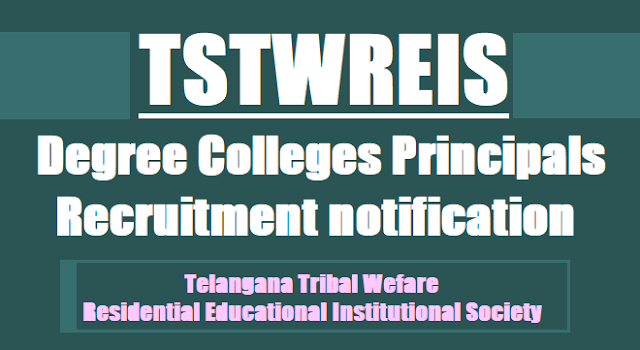 TS Tribal Welfare Residential Educational Institutions Society(TTWREIS) hyderabad has published the Principals Recruitment notification for 22 TSTWREIS Residential Colleges for STs. TTWREIS invites the application forms from the interested retired personnel of TTWREIS/ TSWREIS/TREIS/Govt Degree Colleges, Govt Junior Colleges for recruitment of RDC Principals. d) experience proof for the interview. Hyderabad, - 500 028. Telangana.